The Place Literally one of the highest restaurant in Orchard Road, located on the eleven floor of Orchard Central, Ochre was a little deserted during tRP’s visit. Not the best first impression as the number of restaurant staff outnumbered the diners. Nice dining environment though, with extremely comfy c-shaped chairs and two-seater sofas. tRP also spotted the open kitchen concept bearing much similarities to a certain Michelin chef’s restaurant concept, but yes, Ochre is a classic Italian eatery with good food – really good food. The Food Since tRP started this food blog, we have been going round Singapore to savour a couple of Italian restaurants, with some hits and some misses. A couple of them tRP made a return trip, for some, that was our last. Ochre was one of those tRP had thought would most likely be our only visit there for food review. Cheat you not, tRP plans to return. First up was the Porcini Soup ($12). Italy’s favourite wild mushroom soup topped with truffle foam, it was as good as it sound. The soup was also served with warm bread, and of course, with extra virgin oil and vinegar as dips. Always appreciate restaurants which go the extra mile to ensure their breads are served warm, even better if the breads are prepared from the restaurant’s own kitchen – Ochre is one of the rare ones in Singapore. 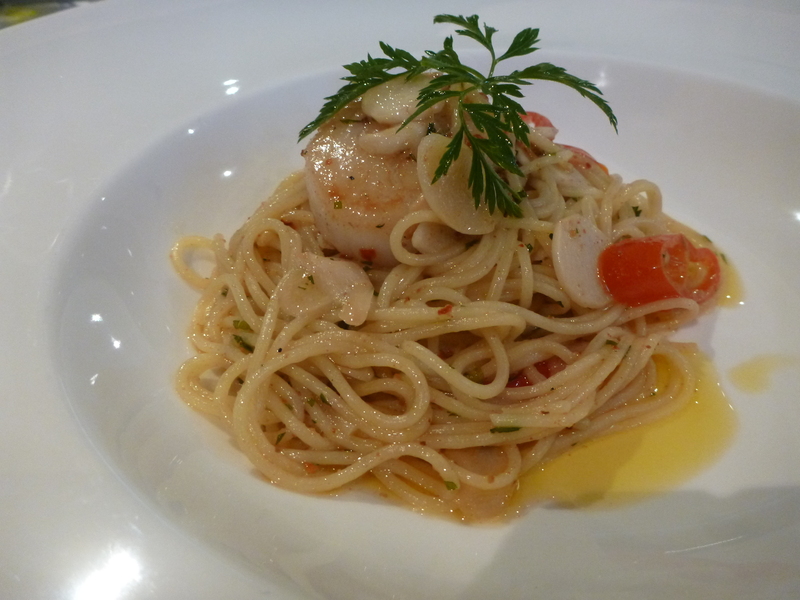 Despite the popularity of pasta in Singapore, most restaurant served rather mediocre replicas of the famous Italian main. But at Ochre, tRP’s was soon about to be wow. Matching pan fried scallops with angel hair pasta might sound like a common find, but almost none tasted as well as the Cappelini Scallop ($34) at Ochre. The pasta was cooked to perfection, with it done together simply with basil, garlic, fresh chili and topped with a (extremely) fresh scallop, it was a true ‘must try’ of the restaurant. Another typical Italian mains – Pizza. tRP had hardly ordered a pizza which ain’t mushroom, so here’s Ochre’s version of Mushroom Pizza – the Tartufo Pizza ($32). Like most good pizza joints in Singapore, the pizza crusts was thin and flaky. While the pizza was not exceptional, it definitely worked well together with the pasta for sharing. Rants Sadly, the restaurant was rather empty during tRP’s visit to Ochre on a Friday night. Would be a pity if the restaurant can’t tide through the competitive market in Singapore. So, do support them! Will I Return Again? Good food with great service, all these and with its location right in the middle of town, here’s to a resounding yes.